Hello everyone!! There's just a ton of 4th of July projects on my blog in the next week. Here's a card made with My Pink Stamper's Yankee Doodles kit that was released on Friday. I had a ton of fun playing with this! I decided to make some cute little treat bags for the 4th of July. I thought they would be fun filled with popcorn or I might put some small trinkets in them for my daughter and friends. There are lots of options. Hi everyone!! It's another fabulous day--Robyn, My Pink Stamper has released another image stamp set kit!! This is called Yankee Doodles and is just so cute!! If you have just arrived from the fabulous Chelle, you are on the right track. If you just stopped by my blog, be sure to start at My Pink Stamper so you don't miss out on anything!! Here is a picture of everything you will receive in the kit. Now, here is a card I made with the kit, some pattern paper and my Cricut! I love that you can use these fabulous image stamps with die cuts and other embellishments!! Your next stop is the fabulous June. When you are done hopping, make sure to head back to My Pink Stamper to enter to win a kit of your own!! And she will be having a My Pink Stamper Live at 11:30am CST/12:30pm EST. Shop Pumpkin Spice will have the kit available to order 12pm CST/1pm EST. That way you can get it in time to make some fun things for the 4th!! Plus, the kit last month sold out in 24 hours--so be sure to order early this month! Here's the hop list is case you get lost along the way. Hello everyone! Here's a small tag I made this week for a small challenge. You may notice that I now have a watermark--I learned the hard way last week that this is important :) I'm still playing around with the software and trying to find what I like for the mark and not be too overpowering. Whew--I think I need to get busy to make sure I have some awesome things to show you all!! Oh and if you have any old links to my blog or my button, be sure to update it with the new URL or button. My awesome Blog Designer Pamela from The Posh Box fixed my blog button so that it goes to the new URL and she also update my header. If you are in the market for a blog makeover, she is fabulous! Hi everyone! I have been thinking a lot lately about my blog title so I am in the process of changing my blog name and domain! I am a little nervous since I love the way my blog looks so don't want to loose anything :) But I pushed the button to purchase so we will see what happens :) I will let you know when the change is complete so you can change your links--And my wonderful blog designer will fix my blog button too. Thanks so much for following and I hope to post a project tomorrow!! Hi everyone! Today, I have some exciting news to share that I have been bursting to tell everyone -- I am now on the Twine it Up! with Trendy Twine Design Team!! Woo Hoo!! I just love me some twine so I was very excited to get this great news in a email a few weeks ago. It's been killing me to keep it a secret--LOL! Editing on Monday am: I forgot that I am supposed to tell you a bit about myself--LOL! I am a married, full-time working mom of 2 teenagers (it pains me to say that!). My son is 15 and just got his learners permit and my daughter just turned 13. We have one dog, Charlie (girl) who is just adorable which gets her out of trouble a lot :) I started scrapbooking when my son was one and then started card making soon after when friends talked me into selling Stampin' Up! Being a demonstrator did not last too long since I was not good at being pushy. 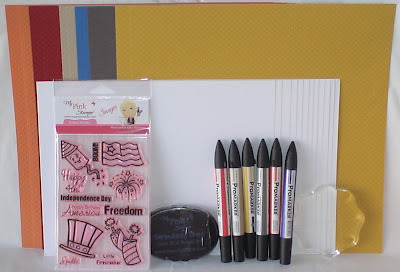 My blog began 2 1/2 years ago and I have been on the My Pink Stamper DT for about a 1 1/2 years. I was also on the Fantabulous Cricut Team for a a few terms too. I am beyond thrilled to be this amazing Trendy Twine Team!! Lesley is just fabulous and I can't wait to get started!! Here's a project that I sent in to try out. I used the Spring Cottage Cartridge to make the basket and berries. I had to get this Cricut Cartridge just because of the basket and berries--LOL! And this project just needed twine to go on it too :) I glued the Krazy for Kraft Twine around the basket and handles. The berries hold one or two pieces of candy and then you close it with the twine. I used the white pen to do some faux stitching on the berry leaves.